Gov Kim Reynolds, in her Statehouse office on Tuesday, Jan 15, 2019. Updated at 5 p.m. Jan. 15, 2019, to include interview comments from Gov. Kim Reynolds and House Minority Leader Todd Prichard. Iowa Gov. 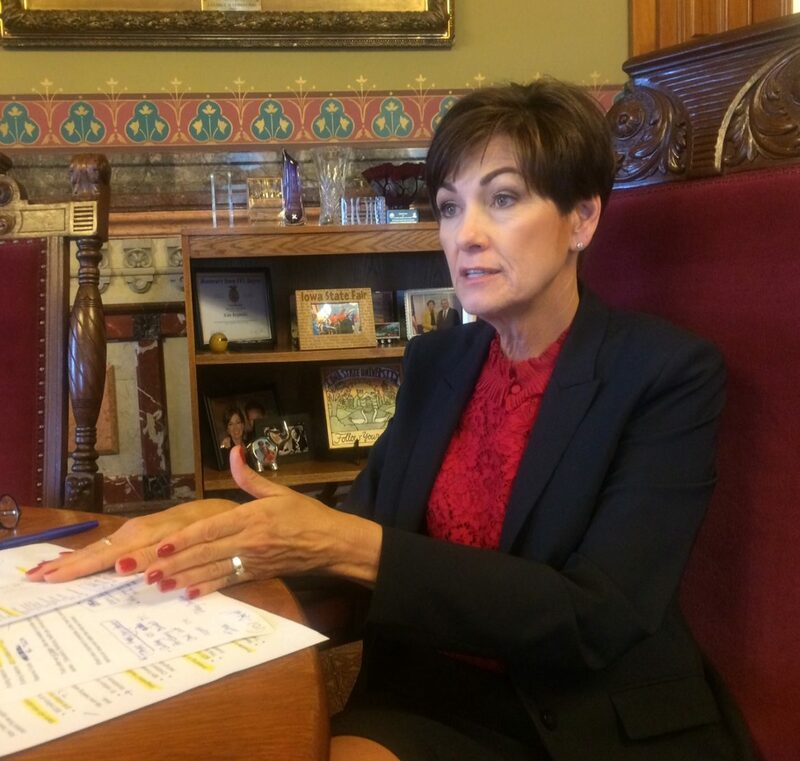 Kim Reynolds stressed keeping promises for mental health care funding, education, rural revitalization and second chances Tuesday in her Condition of the State address. The call for second chances would come via a new state constitutional amendment that restores voting rights for felons who have served their full prison terms. Reynolds paired that proposal with a call to adopt another constitutional amendment preserving crime victim rights. Reynolds is a recovering alcoholic who was convicted in 1999 and 2000 for drunken driving. She has spoken at various times about that time in her past and her subsequent sobriety. House Minority Leader Todd Prichard (D-Charles City) said Democrats favor the constitutional amendment but said Reynolds could restore rights now with an executive order, something Reynolds and her staff dispute, saying Iowa’s constitution prohibits restoring the rights. “There are tools that she has to restore voting rights now,” Prichard said in an IowaWatch interview. “There are long-term and short-term things that she can do and I would encourage her to do both. The question of how to restore felons’ voting rights was one of several surfacing after Reynolds delivered the annual Condition of the State address Tuesday morning at the Iowa Statehouse in Des Moines. Reynolds said she felt good about the address, billed as a call to move forward on initiatives started last year. “The time is now to deliver on the promises that we’ve made to Iowans looking for a way up,” Reynolds told a joint Iowa House and Senate session. Next, the Republican-led Iowa Legislature will determine if it agrees with Reynolds, also a Republican, and, if so, how much money it will provide for the 2020 budget year that begins July 1. Reynolds gave the Legislature a proposed $8.2 billion fiscal 2020 spending plan for general expenses that includes doling out $7.65 billion in state appropriations. Most of that — 56 percent — would go to pre-K-through-12 through higher education. Another 25 percent would go to human services. State budget officials said Tuesday they expect the state to raise a little less than $8 billion from taxes and fees and produce ending balances of $305.9 million on June 30, 2020, and $517.4 million on June 30, 2021. “Our budget is balanced and our cash reserves are full; wages are going up while unemployment is at an all-time low; and we’ve been recognized as the No. 1 state in the country,” Reynolds said in her address. Iowa’s unemployment rate in November, the most recent month for which statistics exist, was 2.4 percent, tied with Hawaii for lowest in the nation. In the IowaWatch interview, she said the state will be able to raise the necessary money after a couple years of lower-than anticipated revenue resulted in state budget cuts. Iowa Gov. Kim Reynolds enters the Iowa House before delivering the 2019 Condition of the State address on Jan. 15, 2019. Reynolds’ road map for addressing concerns about how Iowa delivers mental health care includes adding beds to six access centers in the state to handle people who need short-term stays and establishing 22 mobile treatment teams that can go on-site when someone needs emergency care. She proposes spending $11 million over two years in the state’s Medicaid budget on children’s mental health and $3 million next budget year on training school teachers to better recognize and deal with children who have mental illness-related problems. She also proposes adding four psychiatric residencies at University of Iowa Hospitals and Clinics who can practice in rural communities and additional money to train nurse practitioners and physician assistants in mental health. “We must create a children’s mental health system where the path to healing is clearly marked, a system that lets parents know where to begin—and that their child can begin immediately,” Reynolds said. David Roederer, the state’s Office of Management director, told reporters in a briefing before Reynolds’ speech that the portion of the state’s budget going to Medicaid is projected to go down from 19 percent this fiscal year to 18 percent next fiscal year and then back to 19 percent in fiscal 2021. That follows years of rapid growth, from 7 percent of the state budget in 1990 to this year’s portion. “We believe that that number has stabilized,” Roederer said. Democrats IowaWatch interviewed generally liked the attention Reynolds was giving mental health care delivery. The battle will be over whether or not the state has enough money to do all Reynolds proposed, both Democrats and Republicans said. “One of my concerns, however, is that we still are not fully funding the children’s mental health system,” state Sen. Pam Jochum (D-Dubuque) said. She said adding funding to the state’s mental health care delivery system was long overdue but welcomed. Jochum said she also had concerns that some of the additional funding for K-12 education would come at the expense of other needed programs. “We will work with her as much as possible on the things that we agree on,” Jochum said about the governor. Last year, Reynolds established a children’s mental health board to suggest ways to improve the mental health care deliver for children. “The board has completed its initial task, and based on its recommendation, I will be introducing a bill that finally creates a children’s system that will work in tandem with our adult system,” Reynolds said. Reynolds is fresh off her election to a four-year term after stepping into the governor’s position from her former role as lieutenant governor in 2017. She succeeded former Gov. Terry Branstad, who left his post mid-term to become U.S. ambassador to China in the Trump Administration. Since taking office, Reynolds has pushed a program called Future Ready Iowa that focuses on education as a way to bridge school performance gaps tied to cultural and ethnic backgrounds while building future talent in the state. On Tuesday, she asked for $20 million in fiscal 2020 and adding $12 million in fiscal 2021, which starts July 1, 2020. 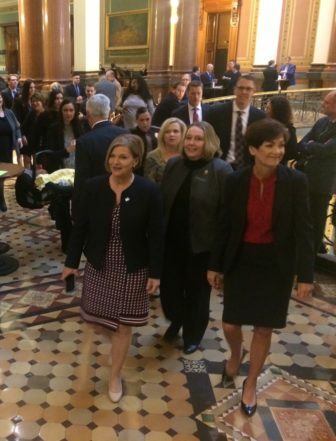 “At its core, Future Ready Iowa recognizes that there is dignity in meaningful work, that Iowans yearn for the opportunity to better themselves, and that those opportunities exist right here in Iowa,” Reynolds said. Her proposed budget includes a $93 million increase in funding for preschool-through-high school education, a 2.3 percent increase per pupil; $1 million in new money for STEM funding; and $11.2 million to help districts with disproportionate transportation costs. The state would pay almost $3.4 billion for pre-school programs, Reynolds’ budget proposal shows. Several legislators weren’t willing to predict the outcome of Reynolds’ funding request this year for education funding this year, recalling the past few years when Republicans held the line on increases. “Obviously, one of the things that we’re going to have to have that conversation about is: the governor asked for 2.3 percent in her Condition of the State address here, but she also asked for $20 million for several other projects as well,” Rep. Ashley Hinson (R-Marion) said. Reynolds’ request for a new state constitutional amendment that allows convicted felons to regain voting rights after serving their prison sentences comes on the heels of a Des Moines Register investigation that showed some people who were not convicted felons were on a list barring them, wrongly as felons, from voting. But the move to change Iowa law had been in the works before The Register’s investigation, focusing on people who belonged on the felons’ list but who had served their time and were trying to be productive again. Reynolds invited some people in that position to the Statehouse for the Condition of the State address. Reynolds had telegraphed that she is interested in letting felons vote after completing their punishment. State constitutional amendments require votes by two consecutive Legislatures and then the general population. Reynolds said she has granted clemency to restore the rights of 88 felons since she became governor less than two years ago. She also called for a constitutional amendment protecting crime victims’ rights, a move that started in last year’s legislative session but stalled. Hinson, a co-sponsor of a House bill last year for the victims’ rights amendment, said she is hopeful that will pass this year because it has bipartisan support. Reynolds called on legislators to expand rural revitalization programs, including housing needs assessments for rural areas. Her proposed budget calls on the state to set aside $5 million for rural housing and $10 million to expand broadband communications to rural parts of the state. “Future Ready Iowa is a powerful tool to grow family incomes, meet employer needs and strengthen communities,” she said. Reynolds called for the establishment of a Center for Rural Revitalization in the Iowa Economic Development Authority and asked the Legislature to establish a home building program at the Newton Correctional Facility. The home building program would hire 320 apprentices in the corrections system to build housing for parts of Iowa that need it, in partnership with the nonprofit Homes for Iowa. Prichard, the House minority leader, said he appreciates the focus on rural issues but a lot of factors are creating problems that need to be addressed. Rural areas need jobs, amenities like grocery stores and — two things Prichard said the state can influence — adequate education and health care. “We’ve got to make sure the services are available in a reasonable distance,” Prichard said. Rep. David Jacoby (D-Coralville) said he sees common issues on which Democrats and Republicans can work together, such as providing adequate mental care and the Future Ready Iowa program. He was referring to a property tax bill in 2013 that limits how much residential property taxes can increase annually and rolled back the percentage of a business’ property value that can be taxed and an income tax bill in 2018 that reduced tax rates for individuals and businesses and created credits for certain circumstances. Democrats said matters generating those fights will include the House’s decision on whether or not to count 29 mail-in ballots not counted in a Winnishiek County election for House District 55 won by a Republican by nine votes, efforts to put U.S. Second Amendment rights into the Iowa constitution and how much state money to send to Iowa’s three public universities.